1. My potential clients aren’t on social media. If you think social media is “for kids” then there’s one major thing to consider: The people you think of as “kids” might already be buying houses. As of 2014, millennials made up the largest portion of homebuyers, with 32% of the US housing market. These millennials are the same generation that grew up on social media, so they spend a lot of time talking about their lives and doing research on social networks. By having an active social media presence, you’re more likely to be seen by these types of home buyers, and you have a channel to connect and converse with them. 2. The more I post, the more followers and likes I’ll get. There’s nothing that makes me hit the unfollow button faster than an excessive amount of posts per day. Buffer and SumAll put together a study on the best practices for posting to the different social networks. They found that it’s best to keep your posts on Facebook and LinkedIn to once or twice per day. On Twitter, 3 times per day or more is best practice, but it’s important to space your Tweets out over the course of the day. Multiple posts within a short timeframe will only expose your message to a small audience. Use a social media scheduler to space out your posts and get the most bang for your buck. 3. Nothing matters more than followers. Assuming that likes and follows immediately translate into valuable engagement is a major misconception about social media. It’s not just a popularity contest, it’s about finding the right people, sharing content they care about, and engaging with them regularly. So, it should go without saying, buying followers or likes of any kind is a bad idea. Many of the people you can buy from these sites are from areas way outside of your target market, or they might not be real people at all. Followers or likes are simply “vanity metrics”. While they might make you feel pretty good about yourself, they’re not really doing anything for your brand. Spend time researching influencers in your market and interact with them to grow your following instead. 4. I don’t have time for social media. While there are social media managers who dedicate their entire careers to creating and executing social media strategies, your probably don’t need a system quite that intense (or time-consuming) to see social growth. The biggest asset to your social media strategy is using available tools to cut down on the time it takes to find and schedule posts. Use a tool like Feedly to help you curate articles to share on social media. You can see all of the articles you might want to share on social media in one place by adding in your favorite websites to your feed. Social schedulers like Hootsuite and Buffer have browser extensions where you can schedule an article you’d like to share on you social channels in a few seconds. 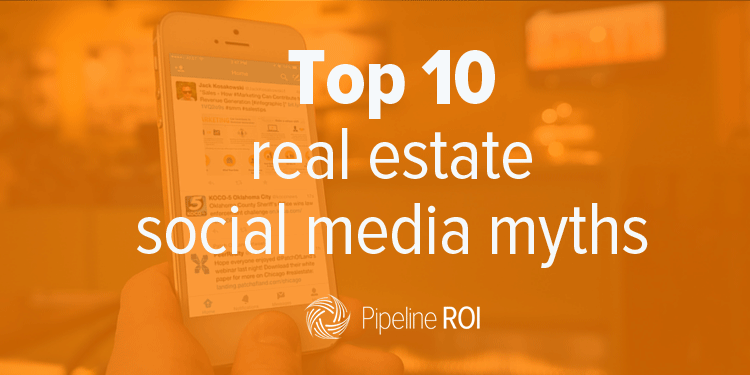 If you’re a Pipeline ROI customer, we have some built in social media tools as well. You can (schedule social posts)[http://www.pipelineroi.com/blog/pipeline-roi-product-update-social-media-scheduler/] to Facebook or Twitter without ever leaving our inbound marketing dashboard. 5. My 17 year old nephew can run my company’s social media. Social media is more than just queuing up a handful of posts and watching the follows and likes roll in. Your social media strategy should include a mix of personal, real estate industry, and local content, and responses to posts from others. But it’s also the voice of your brand to a massive audience. If you want to hire someone to run your social media, then don’t just go for a neighborhood kid because he’s young and “gets” social media. Look for someone who is creative in finding and writing content, and analytical enough to track results. Or, manage it yourself. There’s no one that knows your brand better. 6. I have to be on every social network. You’re running your own business, so you’re busy. The quickest way to get overwhelmed by social media is to attempt to be active on every single network. If you’re handling your social media on your own, choose 3 that you’re going to focus on building your brand through. You should also choose these networks based on your target market. If you have a very urban, young market, then Instagram is a great choice to focus on. If you specialize in family homes, particularly in suburban or rural areas, your market may be more active on Pinterest. It’s better to be really good at a few networks than dabble in too many. 7. There’s no way to see what’s working. Many small business owners are hesitant to spend much time on social media, because they think tracking the ROI is too difficult, or there’s no analytics to know what’s working. Every major social network has insights or statistics to help you know how your channel is performing. On Facebook for Business, you have access toFacebook Insights, where you can see engagement, page likes, and post reach trends in easy to read charts. Just head to your Page, then select “Insights” from the top navigation. On Twitter, you can see what’s working by clicking your profile image in the top right of your Twitter homepage, and selecting “Analytics” from the drop down. Here you can see a summary of your Twitter account over a certain period of time, including your top mentions, top performing Tweets, and even stats about your followers. Pinterest also offer an analytics feature on business accounts that will help you see what people are pinning from your site, and the demographics of your followers. 8. I can’t get personal on my professional social media. The idea that you have to keep your social media 100% real estate related can make for a boring channel. One of the big perks to an active social presence is that you become more than just a tough-negotiating real estate professional to your followers, you become a real person. And people love working with real people, especially when they have things in common. So don’t be afraid to post pictures of your hobbies and interests, whether it’s baking cupcakes, brewing beer, or running marathons. You can have an instant connection with someone who could be a future client that starts from a shared interest. 9. Hashtag everything. It’s the way to get found. Excessive use of #hashtags comes across as obnoxious and can make your posts unreadable (Which can lead to an #unfollow.) It’s best to keep your tags to a minimum of one or two on Twitter, 5 or 6 on Instagram, and for other social networks they’re not really necessary or beneficial at all. It’s a common misconception that adding hashtags to your posts on Facebook or Pinterest will affect your visibility, but it actually doesn’t, and can make your posts appear spammy. 10. I can’t generate leads from social media. You know all those awesome lead capture tools on your website? How are you telling people about those pages? If you’re crossing your fingers and hoping they come across you on Google search, you’re missing out on a big opportunity to collect some contact info. Sharing these landing pages and other site content on your social channels is a solid method for driving traffic. It’s important to make sure the pages you share add value for your followers, so blog posts, content pages, and eBook landing pages are a good choice. If you’ve found the right audience on social media, you share valuable content, and you’re consistent, then social media can turn into an excellent source of leads.